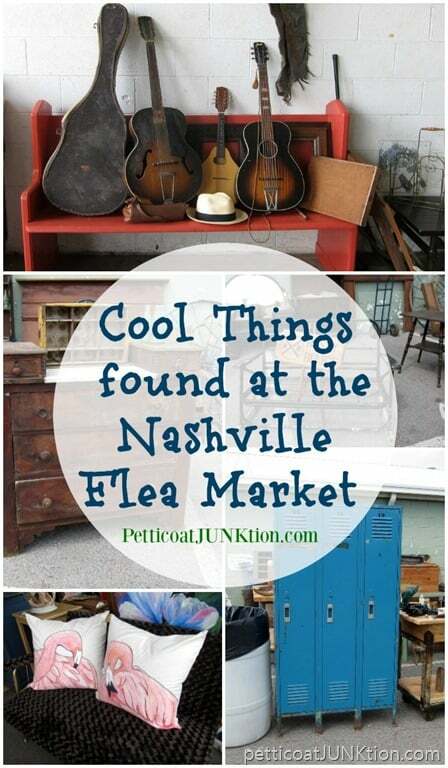 Nashville is known as Music City but I think if it as home to the Nashville Flea Market. 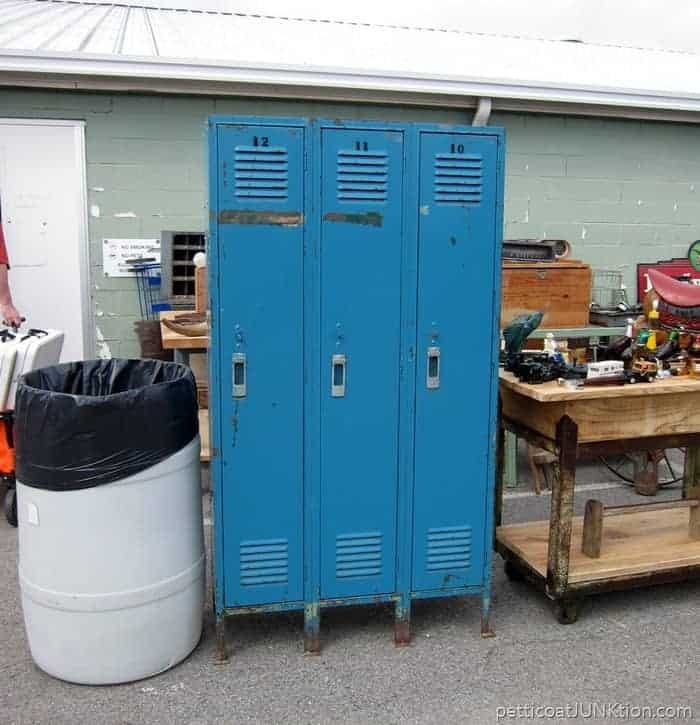 This is my first trip to the flea market since last November. That’s a long span without my flea market fix. Either the weather didn’t cooperate or I was out of town, or something kept me from going. But due to a change in family schedules we were able to make it to the market on Friday. The weather was perfect. I got to visit with some of my favorite vendors and also enjoy just being outside. I very, very seldom shop the vendors indoors. I like the junky stuff outside. 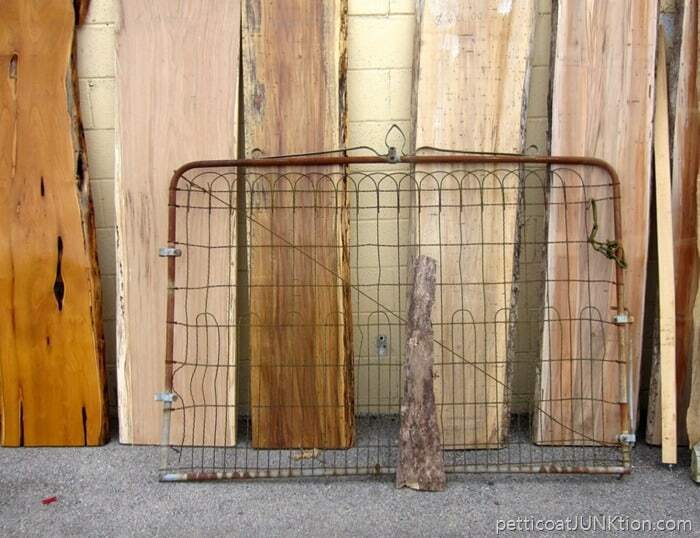 How cool is that gate….and the slabs of wood. 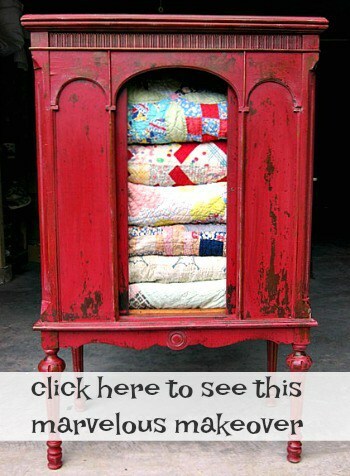 A new vendor! 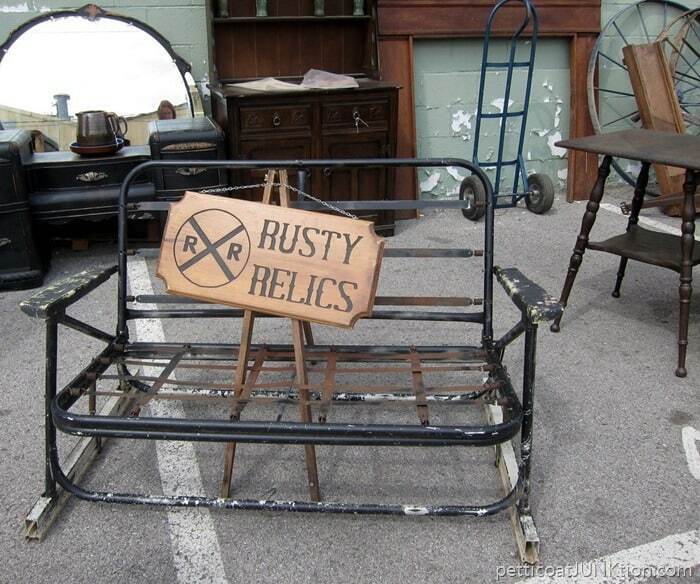 Loving the black paint and rusty metal of the glider. I have to throw in a little new stuff every now and then. 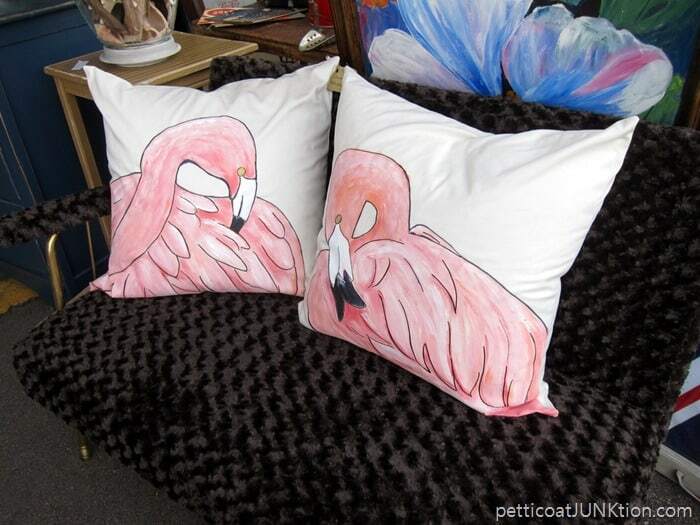 Especially when it involves pink flamingos. 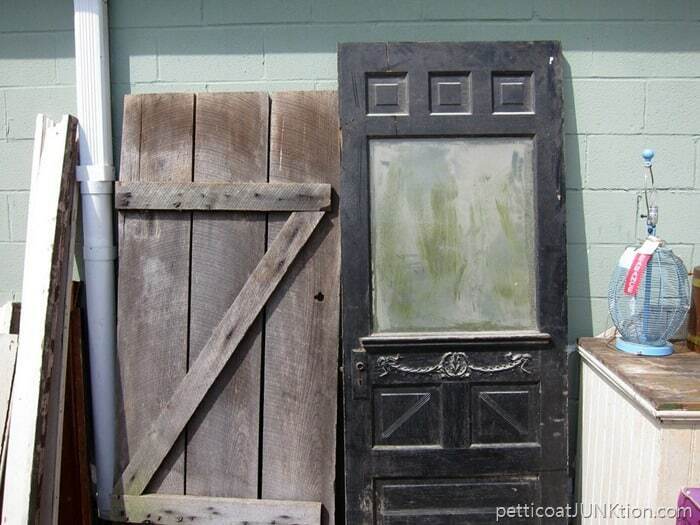 I wonder how old that black door is? Maybe from the early 1900’s? I’m not good at guessing ages of architectural pieces. 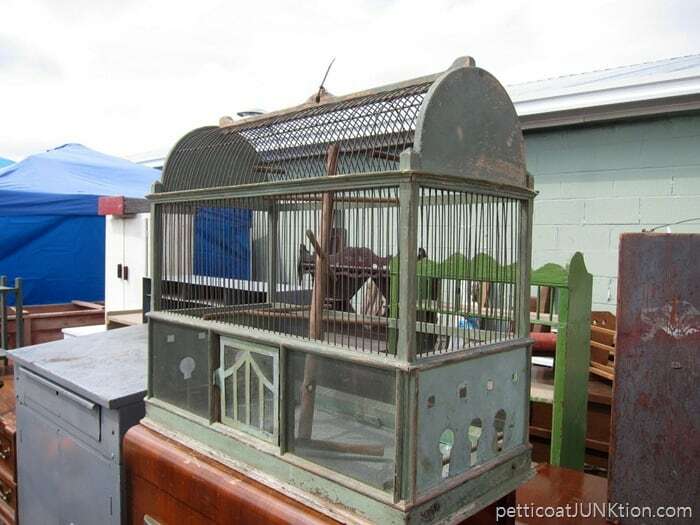 The humongous bird house has the perfect patina. 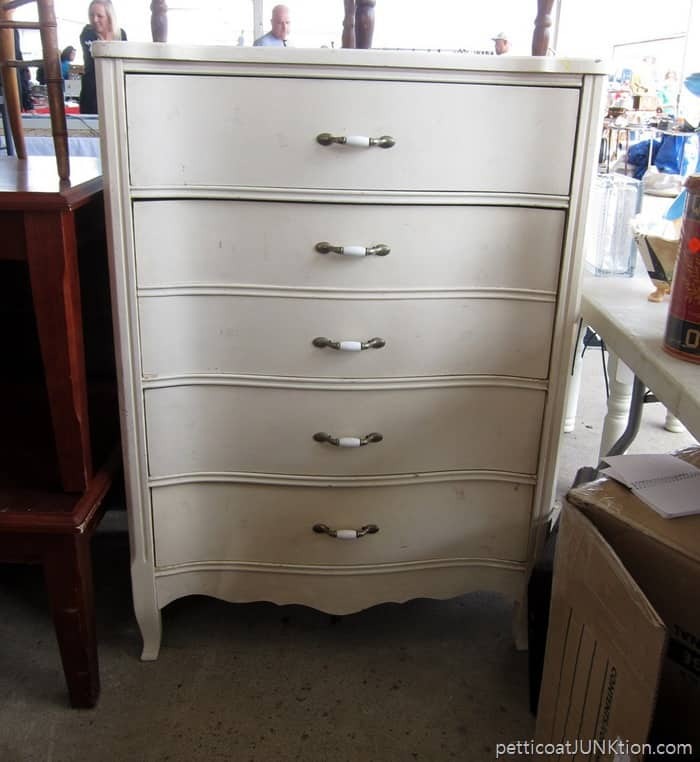 I purchased this white chest of drawers for $40. A pretty good deal. The bottom drawer front was completely separated from the drawer body but the JTS has already glued it back together. I mixed up a special paint color and hope to start painting it today. 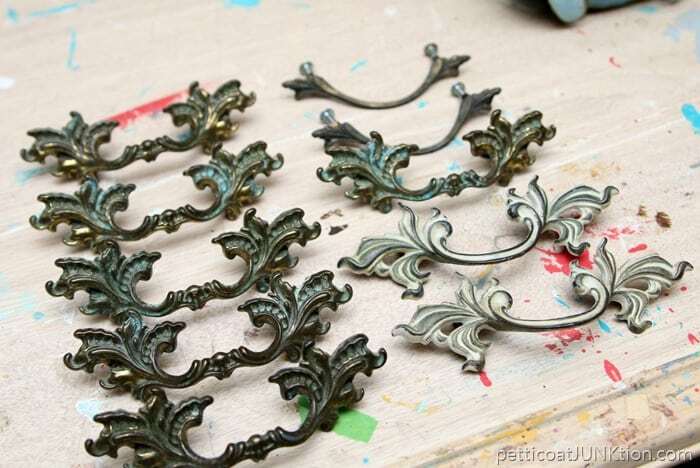 I also found the French Provincial hardware at the market…..$1 each…..a steal. I had to have this whimsical little piece. The rusty frog had me at hello. 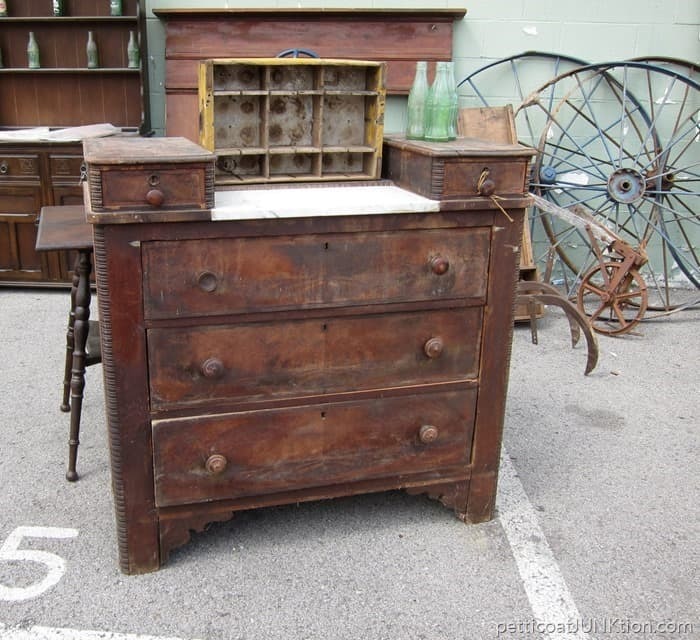 Find more photos from the Nashville Flea Market on my Pinterest Board here. 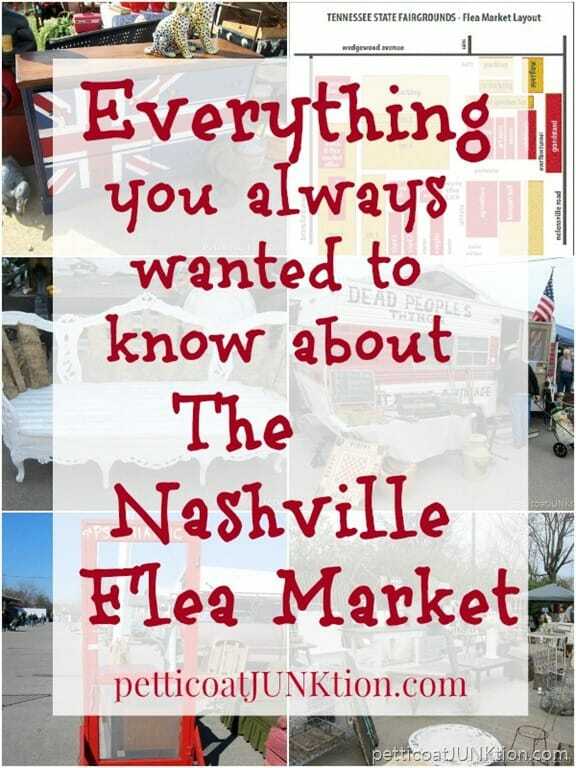 For all the details on the market including hours, parking, shopping tips, click the photo below…. What did you like the best? Have you visited Music City? Leave me a note and I’ll see you tomorrow….or the next day. Have a great day! I just saw 2 different addresses and the one with 2 b’s is the correct one. Not sure which one I sent it too because I deleted it. I will try both next time. Sorry we missed each other! Oh, I’m so jealous! I love Nashville! You are so lucky to live close to such a great flea market. I’m hoping to get up there as a vendor this year!! Keeping my fingers crossed!! I saw several cool items! The hardware was a great buy!! The frog is Home Interiors. I think I have all they made in tins as this, sold HI for over 30 years. Thanks, I didn’t know that. My aunt sold Home Interior. She had a really good business with it. I had tons of the decor back about 35-40 years ago, lol. 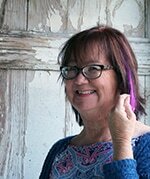 Kathy, I love reading your posts. Nashville, aka Music City, I want so badly to visit it. 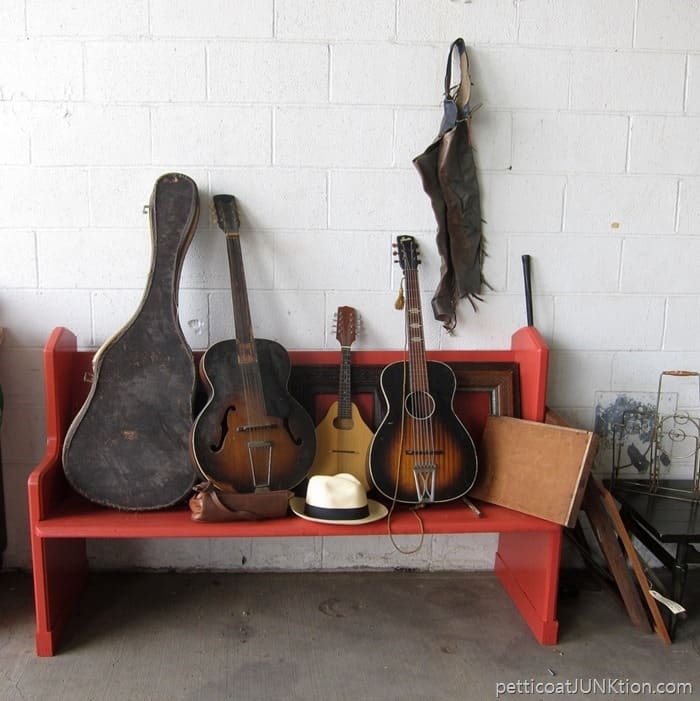 The flea market is another reason I need to plan a trip, rent a pick-up and hit the road. Yes, you should! Thanks for the sweet comment Delores. Great stuff! 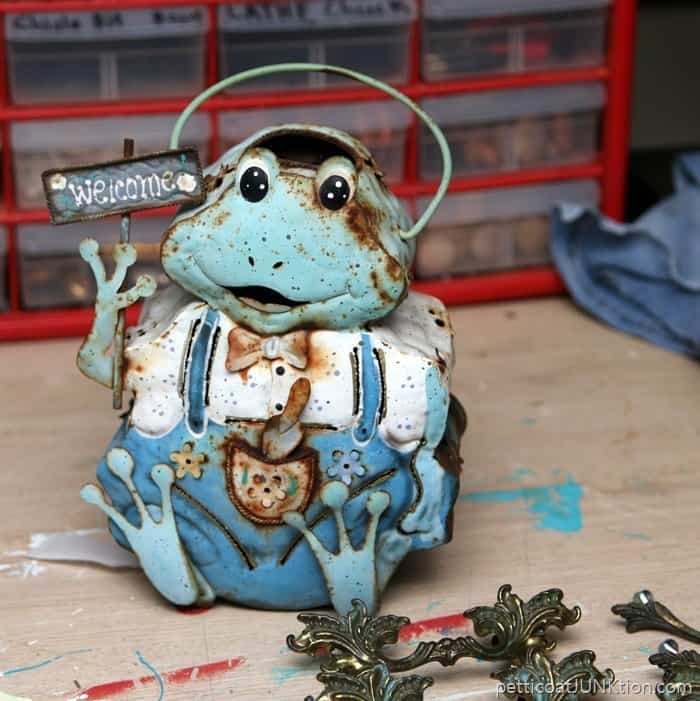 Love the rusty frog. WOW! I see a tractor trailer load of stuff that I want. Maybe I don’t need to go there, the place might bankrupt us. I love the handles and frog. Good pick on the dresser too.